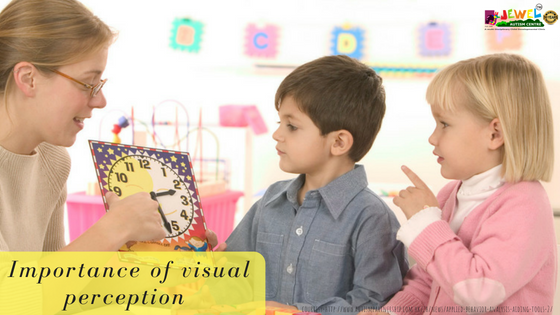 Visual perception refers to using a picture or other visual item to communicate with a child who has difficulty in understanding or using language. Visual perception can be photographs, drawings, objects, written words or lists. Research has shown that visual supports work well as a way to communicate. Visual perception is used with children who have Autism Spectrum Disorders (ASD) for two main purposes. It helps parents communicate better with their child and it helps their child to communicate better with others. Children and adults with Autism have a great need for structure and safety. They may anxious or act out when their routine changes or they are in unfamiliar situations. Visuals can help them understand what to expect, what will happen next and also reduce anxiety. Visuals can help them pay attention to important details and help them to cope up with changes. It uses visual strength and therefore provides a receptive communication system to increase understandings. It helps the individuals to learn new things and broaden their interests. Helps remain calm and reduce inappropriate behaviours. Helps the individual to develop independence and self-esteem.